Back in December, I wrote a blog post about this article on the NHS Choices website. In short, I felt the ‘article’ put a very biased, unbalanced and potentially misleading case for carbohydrate in the diet. The day after writing the blog post, I decided I would make a formal complaint about the article to NHS Choices itself. Here’s my complaint, written on 21st December 2013. I’d like to complain about this article: http://www.nhs.uk/Livewell/loseweight/Pages/the-truth-about-carbs.aspx. The article tells us that that carbohydrates are a major source of energy. Even on a very low-carb diet, individuals are able to get energy fat and protein, and the absolute requirement for carbohydrate in the diet for energy is actually none at all (if we’re going to be accurate about it). Regarding weight control, there is no recognition in this article of the influence of hormones such as insulin and leptin on fat storage, and the differing effects of the major macronutrients here. I believe that the idea that ‘fibre is filling’ is also misleading. In fact, there is evidence to show that when individuals adopt a low-carb diet, they very eat several hundred calories less each day quite spontaneously. The article cites one study as evidence of the fact that low-carb diets do not produce better weight loss in the long term, though attrition rates (and possibly adherence) was poor. See here http://authoritynutrition.com/23-studies-on-low-carb-and-low-fat-diets/ for a comprehensive review of 23 studies which demonstrates superior results achieved by low-carb diets with regard to weight loss and disease markers. To my mind, dietician Sian Porter and the NHS Choices website have done a bad job of communicating the facts and summarising the evidence. I wish to formally complain about the inaccuracies in this article and its (to me) clear bias and lack of balance. On the 6th January 2014 I received a response from NHS Choices, acknowledging my complaint, and saying that my query had been passed to the ‘Subject Matter Expert’ at NHS Choices. It’s now 2 months since I made my original complaint, and I am still to receive a reply that addresses my concerns. 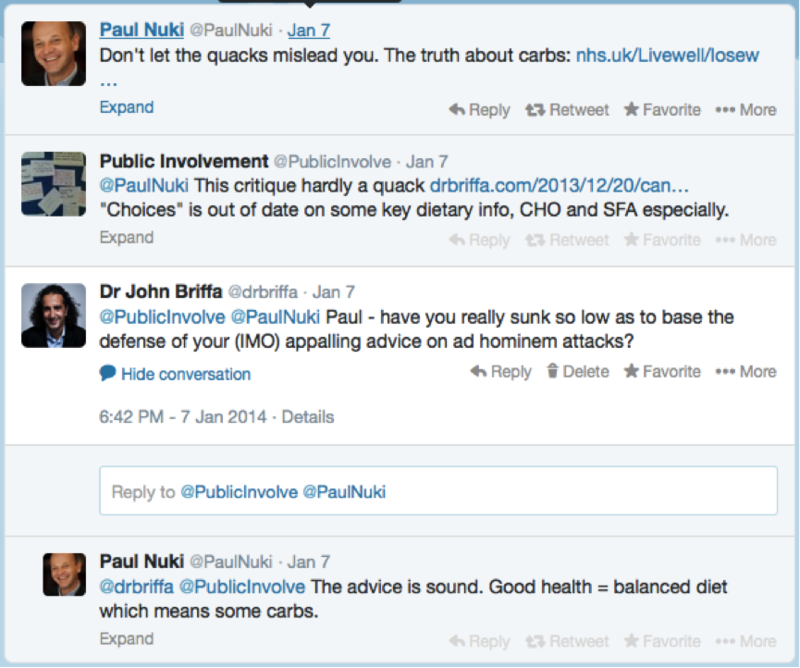 In the meantime, though, the chief editor of the NHS Choices website, Paul Nuki, had time to describe (on twitter) those who express doubt about the NHS Choices advice about carbohydrate as ‘quacks’. Here’s a screenshot of his tweet, a couple of responses to it (including one from me), and then Paul Nuki’s (in my opinion) tired, lame ‘balanced diet’ line. NHS Choices has a section called ‘Behind the Headlines’ which has teamed up with an organisation called ‘Sense About Science’ to create what they call ‘Healthy Evidence’. You can read about this here. This, remember, from part of the organisation (NHS Choices) that has yet to respond to the complaint I submitted two months ago about what I believe to be their very misleading and unscientific stance on carbohydrate. Oh, the irony! I would like to apologies for not sending the response through to you regarding your inquiry and complaint about our LiveWell article on Carbs from Dec 21st. The content team have informed me that you have contacted a number of times as you have not received the response they sent to me to pass on. If you have not received it I can only put this down to error in sending a high volume of responses out on that particular day. I want to apologies for any inconvenience this has cause. The “review of 23 studies on low carb diets” does not appear to have gone through the standard methodology for producing a scientifically valid systematic review and therefore does not meet our criteria for inclusion. Questions you should be asking about the review: who carried out the research, what was their selection criteria, how rigorous was their search for evidence, what methodology did they use, was the study published in a peer-reviewed scientific journal? Well, others will have to make their own mind up whether they feel the people at NHS Choices have engaged with the points I raised. I know what I think: that their original article and now their response to my complaint have failed us all, comprehensively and utterly. I am glad you’re holding their feet to the flame on this one. I suspect they assumed you’d forget about it if they ignored you. They claim to be fans of Evidence-Based advice. Let’s see the evidence, then! And not just one poorly-designed, badly concluded study. Please report back here again in a month or so if they still haven’t responded meaningfully – or at all – so that the refusal of this publicly-funded body to be held to account can be made continuingly clear. Symptoms of a lacking scientific education. People seem to think “scientist” is a title like any other rather than describing a reliable method of investigation regarding thr natural world and an attempt to determine cause & effect according to agreed upon principles. How far will the nutrition/medical profession sink? Another irony is that the idea of a “balanced diet” came out in the 20s and 30s because many people were getting seriously ill from nutrient deficiencies from diets based on refined grains. Eating plans from that era recommend a variety of meat, fish, fruit, vegetables, fats, dairy and cereals so that people would get a variety of nutrients. “Balanced diet” means nutrients, not a boatload of carbohydrates. Bravo for keeping the pressure on them to acknowledge biological facts. 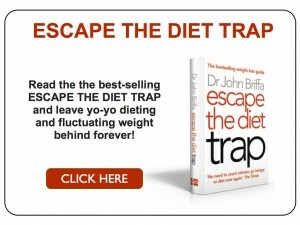 The many LCHF letters, emails, books, blogs, etc are like Chinese torture…. truth goes drip, drip, drip, drip until the dissonance in their brains is too painful and hopefully they wake up. Unfortunately (and I’d love to be proven wrong) the current paradigm of a high carb, grain based diet being optimum isn’t going to change anytime soon. By anytime soon I imagine for at least 10-20 years. The current crop of people in charge and setting the guidelines have to leave, retire or die off. Sad but true I’m afraid. I reckon 5 years max. It’s already changed in Sweden, and when Swedes inevitably on average get slimmer and healthier, it can’t be ignored. Also, just as F1 technology trickles down to road cars, so will the latest sports science ideas on low carb – high fat, which apparently contributed to Australia’s Ashes victory. horrifying concept considering how carb-flu makes me feel every time I have to go into ketosis to get back down to weight. Thank you yet again Dr B, not only for bringing these publicly stated untruths to our attention but also in trying to hold individuals who make them to account for their actions. I do find it so interesting that when you challenge these people for their unsubstantiated public statements they either try to deride your opinion with a sleight on your abilities or try to hide behind some kind of “official” statement or standpoint. In my experience both of these tactics are the refuge of folks who already know their opinions cannot stand up to ant form of scrutiny. Thank You Dr B for continuing to flush them out and expose them for what they really are. When it is a made-up name not a person, and especially when it is a Campaign, you know Science has left the building. How can losing weight be toxic? You just can’t lose weight without breaking down stored fat! Why then brain and muscles use ketones as their preferred fuel, if they are toxic? And the side-effects they describe are only transitional effects from glucose burning to fat burning, but they choose not to mention it. Appalling. I have sent a complaint of my own, asking why the author of the NHS Choices article seems ignorant of the role of gluconeogenesis and of ketogenic adaptation’s glucose-sparing mechanisms. I also point out that the author confuses endogenous glucose with exogenous carb requirements, which is worrying in someone who has been given the responsibility for communicating national nutrition policy! A piece riddled with so many basic scientific errors should not pass first review; that it is nevertheless the basis of official public advice is thus scandalous. And note: the problems with the article are rooted in basic, factual scientific errors. Its enormity therefore goes beyond just whining about the dubious-but-debatable areas of nutritional philosophy in which it dabbles. As with Dr Briffa, I expect no reply to my complaint. But even so, the metabolic illiteracy in such tax-funded pieces demands multiple illumination. I’m the Managing Director for NHS Choices. You should have had a reply and I’ll find out why you haven’t. Thanks for alerting us. 1. do you think that the response to my complaint engaged in a meaningful way with the points I raised? 2. are you satisfied with the response, as well as that your organisation has done its job in terms of providing the public with accurate, evidence-based information and advice, in this instance? I think we could have done the whole thing a lot better. The delay in response is unacceptable and I think we need to give you a better response after a two month delay. I will be looking at both issues and I will get you a better response in the next few days. But I am happy with our approach to evidence-based information and our clinical sign-off process. But I’m happy to discuss any concerns you have. Would you like to come and meet the team and put your points personally? Thank you for your response and I very much look forward to a more complete addressing of my concerns in the next few days. Despite what you say, I have my doubts about the ‘evidence-base’ of the advice in this instance, and would be delighted to meet with your people and put my points to them. In particular, I would very much like to meet the person/people who wrote the original article, as well the individual ultimately responsible for assessing it as fit for publication on your website. Also, I would be very interested to talk to the person/people responsible for the original response to me complaint. 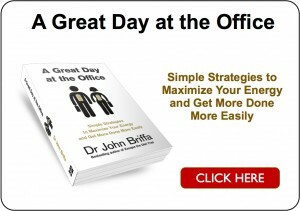 I can be contacted at john@drbriffa.com to arrange a mutually convenient time. Paul Nuki brought your company (NHS Choices) into disrepute by maliciously referring to Dr Briffa / other health professionals with contradictory views as quacks and that on Twitter. Such an action is a dismissable offence and should be dealt with in terms of your disciplinary policy and procedure !!! It would be great if you could urgently restore the credibility of your organisation by eliminating this bullying corporate culture so that the health of the tax paying public that is at stake, can be looked after properly. Please keep in mind that your peer reviewed research is not superior to the peer reviewed research referenced by other health professionals such as Dr Briffa. It should be all about our health and not about corporate or personal interests. Very well said (all of it). As Dr. Briffa has already said, very well put and I wish I had thought to do the same! Jonathon, thanks for joining the debate. Hope everyone keeps it friendly, aswell as evidence based. 1. I think the NHS (generally) and its assorted health educators believe the general public is ‘intellectually challenged’ and utterly unable to deal with any degree of complexity. Therefore it attempts to reduce its messages to a degree of simplicity which makes them inaccurate. 2. The reply you (eventually) got. Every time I cite a study at a doctor who is trying to give me advice I consider erroneous or at least questionable, they will discount it on the grounds that it hasn’t appeared in the BMJ and/or the researchers lack international profiles. As a non-scientist who is nontheless used to questioning academic outputs, I would find it really useful if you could at some point write about how those of us who are not medically qualified can usefully counter this ‘stonewalling’ of our queries. While entirely cognisant that not all research is equal, as you show only too often, even some of the most ‘prestigious’ research has questionable antecedents. Ali—Peter Gotzsche points out in his book “Deadly Medicines and Organized Crime” that the BMJ, NEMJ and other often cited publications are usually the worse when it comes to manipulating data and publishing studies loaded with conflicts of interest and biased perspectives. I think you made a tactical error pointing them to the article, as the article itself clearly hasn’t been through peer review or published. If you send them the links to the actual 23 studies they can’t make the same judgement or excuse. Sorry to go off at a tangent, but could Daniel Gouldthorpe of The NHS Service Desk really not spell ‘apologise’? Card-brown? If ever there was a demonstration of both irony and QED, you’ve just made it. You don’t need to be very astute to see this is obviously a bunch of lies, the response was written in the last few days, this is precisely the problem with dogma, politics, people will defend their position at any cost, even to become a bold liar isn’t a problem. Paul Nuki, Daniel Gouldthorpe, examine your consciences and do the right thing. If NHS Choices is happy to employ someone like Daniel Gouldthorpe who has evidently failed to master the basics with respect to communicating in his mother tongue, it does not leave me feeling confident that anyone else in the organisation is competent to make informed judgements about anything at all. Daniel’s email has just left me wanting to question the qualifications and experience of every single member of the ‘NHS Choices Content Team’. Do they have solid, scientifc backgrounds so that they can make informed judgements or are they just responsible for translating the content they are given into laymen’s terms? Who actually assesses the content we see and what qualifications do they have to do so? Finally, of course, are any of the content assessors / providers conflicted by external interests? For me, the NHS Choices response has raised far more questions than it has answered. It is the methodology of the original studies that is important, since you were using this selection of studies as a rebuttal of the poorly conceived NHS Choices article, not that of the “review” (which the Authority Nutrition article does not claim to be). I received a similar reply after pointing them to the list of studies, like Dr B I was merely using the list of studies (which has links to the actual studies as well as summaries) to point out their existence so that obese Dietitian Sian could perhaps incorporate them into a more balanced review. I also suggested they should call the whole thing “The argument in favour of carbs” (which it clearly is and commission another article “The argument for low carb diets” thereby providing balance and objectivity. Thanks Dr. B for your consistent search for true solutions for our health and wellbeing. Sadly this is not the first time the NHS (or other similar government health providers) “failed us all, comprehensively and utterly” however with your help, insights and knowledge, some of us are able to make better choices for our own health and not have to blindly rely on the not-so-well-informed NHS to drug us as an excuse to making us healthy. The difference needs to be emphasised repeatedly that carbs from veg ,fruit,seeds,pulses and nuts are part of a balanced diet but refined carbs ie sugar and flour are not.If NHS Choices think they have all the answers then what is their explanation for the explosion of obesity and Type 2 diabetes. you have to go low-carb high-fat to deal with it, but our medical establishment don’t like that diet. They consider it to be faddy and unsafe (ie. they haven’t bothered to do trials as there’s no drug profits to be made from it). it was the good Doctors book that set me on the right path following my T2 diagnosis. I wsa diagnosed as a T2 diabetic three years ago and, like you, was told to eat carbohydrates and shown a model of that Eatwell Plate. LIke you, I put on weight and was on the maximum dosage of Metformin. S|nce buying Dr. Briffa’s book and following its advice, I am now at the stage where I am experimenting with not taking Metformin at all – and am maintaining better sugar control without it than I haev managed by taking it and eating as conventionally advised. Don’t get me wrong: I still take Metformin as needed (last night, for example, after scoffing a bag of sweets at the theatre) but I have reduced my medication significantly and stablisised my sugars much better since deciging to follow Dr. Briffa. I am also losing the weight I put on without feeling hungry. INterstingly, my partner is hypo-glaecaemic and this diet works for her too. Not only is she also losing weight but she no longer exhibits sym,ptoms of hypo-thyroidism (she didn’t have it but had many of the symptoms) and no longer experiences panic attacksdue to sugar crashes. My blood monitor proved very useful in diagnosing that particular problem when her concerns over many years were repeatedly dismissed by a number of GPs as being those of a neurotic woman. Persoanly, I think a proven blood sugar level of 3.5 would induce a panic attack in anyone but that’s a different topic entirely! All you really need do is sit back and wait, and be entertained by how the UK Nutritional Establishment manages to perform a U turn without losing too much face. It now has ranged against it, the Swedish Government and the world’s leading sports scientists. Resistance is futile. Carbohydrates which, it is said, turns to glucose in the body except apparently those of fructose and other sugars which Dr Robert Lustig suggests are toxic. Could the confusion or misunderstanding arise from describing carbohydrates in generic terms? It would appear from the shape of our teeth that we are able to consume a broad diet. What I found interesting in Dr Lustig’s lecture, at its beginning (2.20), is when he says that a carbohydrate diet is equally as beneficial as the Atkin’s diet; see: http://www.youtube.com/watch?v=dBnniua6-oM. Surely this would indicate that the body is selective in how it deals with what we refer to as carbohydrates. The body appears to have its own intelligence which differs from that of ours. Up until around the 1950s harvesting of grain included leaving it in ricks and stacks in fields until the local miller was ready. During this period the seed was subjected to sprouting which eliminated the poisons it contained to ward off predators; its nutritional value then increased in preparation for regrowth but with today’s combined harvesters this process no longer occurs. Additionally, flour in bread making is bleached to make it more appealing and attractive and this process must be harmful to the body. Could it be that science is failing to consider the wider implications of the historical processes involved? Maybe the NHS should also look to Sweden who have advised their people to eat a diet higher in fat and lower in Carbs! completely NON-ESSENTIAL for human life. diet for obesity. N Engl J Med 2003;348:2082-2090.
and there’s plenty more like that. In many of the pro-carb reports such as Ancel Key’s “Six country….” and “Seven country….” studies were grossly selective and were seriously flawed in fact and in the statistical analysis. Many of the studies that I have seen relied on question and answer over a period of years. This form of “research” is well known to be badly flawed. They also fall down with regard to diabetes in that carbs are absorbed mainly as glucose (the problem sugar in diabetes) and fructose. My question, always unanswered is why feed a diabetic with glucose and then try and block its absorption, its production in metabolism or increase its excretion with drugs? As I have said before, while Govt. employs Big Food, Big Pharma and Big Business KOLs as experts, the advice will always be in favour of a commercial benefit. Sadly we’re up against human nature. I do feel hopeful though, but only because of the internet. I can’t believe the ignorance. Loved your 1/2 hour slot on the radio…. only wish the BBC would give you at least an hour a week to show the masses how wrong the usual ‘medical’ advice is. A very good downloadable (or view online) documentary investigates our demise into a diet heavy in refined carbohydrates and the health implications – Cereal Killers, by Donal O’Neill. Perhaps the “Subject Matter Expert” was out to lunch! That’s why we should have listened to grandma: “You are what you eat”. It doesn’t take a rocket scientist to figure out that our processed food experiment has been an abject failure. Humans have never lived on a high carbohydrates diet throughout our evolutionary history–that is until now. I apologise for not having read all of the comments before posting mine. I would dearly love to see you reply roughly along the lines of the following. In my communication to you of December 21st, for your convenience, I provided a link to a brief article which LISTS twenty three duly peer reviewed and published articles concerning low fat vs low carb dietary patterns. Inexplicably, your team seems to have mistaken this list for a scholarly review article which, of course, it is not. When qualified members of the Content Team have been directed to scroll down to the LIST of articles, to read each and to consider the contents of each, I will expect a considered response to my complaint. The one study that NHS referred to, what do we know about it? promotes their (apparent) views but truly represent a cross section of available good research ensuring tax payers get maximum good value for their bucks. Could you also go back to the NHS-referred to study and apply the NHS-listed criteria to this one? Keep up the pressure now when you at least have received a response and a name ! the more detailed reply by the more anonymous: “The NHS choiches content” . Just how does this qualify him to comment on the science of carbohydrates? Oh well, I guess everyone is entitled to their opinion. It’s just too bad that someone with this level of ignorance has such a big stage. After years of watching my weight rise steadily in spite of a low calorie intake (averaging 1200 kcals a day) I read your book and changed to a low carbohydrate diet. The weight hasn’t dropped off, but it is going down gradually and, more importantly, I’ve lost 4″ off my waist in 2 months. I was reminded that when I was a child back in the 1950s, anyone wanting to lose weight cut out bread, cakes, biscuits puddings and potatoes – in other words, foods that were high in carbohydrates! It’s taught me that we should always question advice, no matter how “expert” the source….